Patricia Lopez was presented the Chancellor Robert D. Sparks, M.D., Award in Public Health and Preventive Medicine at the annual College of Public Health Awards Banquet. Dr. Khan and Pat Lopez, recipient of the Chancellor Robert D. Sparks, M.D., Award in Public Health and Preventive Medicine. Lopez is a site visitor for the Public Health Accreditation Board for local health departments in other states. She works with local health departments to assist them in preparing for national public health accreditation. For the past seven years, this project has taken Lopez to national meetings to work with peers in other states. She was instrumental in the passage of LB692, the bill that created regional public health departments in Nebraska. Her work with the state legislature, community partners, primary care, education and others made it possible for so many to agree on the importance of establishing a state-wide local public health system with the funding from the Tobacco Settlement in 2001. Local public health districts now cover all 93 counties of the state to assure the public health of all Nebraskans. Lopez played a major role in assisting the new health departments with examples of state and local laws, policies and procedures, human resource information and others. She volunteers as the director of the State Association of Local Boards of Health Section of the Public Health Association of Nebraska and provides education and assistance to board of health members. The Sparks award recognizes an individual who has shown outstanding innovation, excellence, collaboration and impact on health promotion, disease prevention and advancement of effective public health. Dr. Robert Sparks, a former chancellor of UNMC, established this award through the University of Nebraska Foundation. 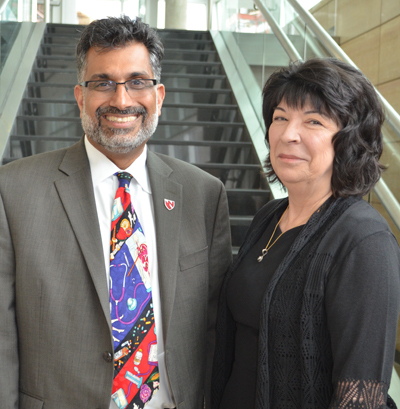 Ali S. Khan, M.D., M.P.H., dean of UNMC's College of Public Health, said, "Pat has been a tireless champion of public health for 30 years and she still continues." Brandon Grimm, Ph.D., director of public health practice and of health promotion, social & behavioral health, nominated Lopez for the award. It was the first time the award has gone to someone who works at the grass roots level, he said. "Without Pat, the public health infrastructure wouldn't be where it is in the state. She was the one who brought all the partners together to determine how the tobacco settlement money can be put to the best use in Nebraska. She wants local public health departments to succeed and a lot of what she does is on a volunteer basis," he said.